I know its early and its only 151 days until 25th Decemeber and that is all packing for their summer hoildays. Well in one exclusive place in Knightsbridge Christmas has come early! Today as I took a visit with a family memeber for her birthday to Harrods, the upmarket store 2nd floor was turned into a winter wonderland! Yes Father Christmas has come early..He was in the Christmas department which opened this morning. The 8,000 sq ft room on the second floor boasts elaborate displays of Christmas trees bedecked with gold and silver ribbons and baubles spelling out the name of the store in glitter - and enough tinsel to wrap over 20 football pitches. The shelves groaned under the weight of gifts, ranging from a simple £1.95 tree decoration and going up to a life-sized Father Christmas decoration selling for a blow-the-budget sum of £2,999. Christmas music filled the air as the Santa and his helpers prepared to welcome summer tourists, shorts and all, into the Christmas-themed room. Father Christmas entered into the spirit of things, tucking into festive ice cream flavoured with eggnog, mince pie and - fetch the bucket - Brussels sprouts, part of a selection of Christmas-themed food products that will be on offer between now and the big day. 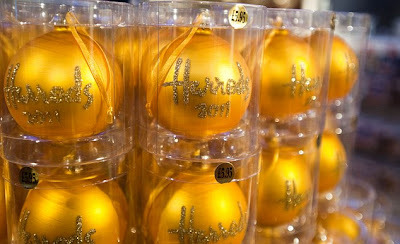 The opening comes ahead Harrods larger Christmas Grotto, which will open on 5th November as Normal.